Many people find one of the most enjoyable aspects of Halloween to be the myriad creatures associated with it. Legendary villains such as Dracula, the Wolf Man, Frankenstein, and zombies of all stripes emerge on or about October 31st in the forms of costumes, films, and books. America’s tendency to associate such creatures with Halloween is so embedded in our culture that we frequently forget that most of these creatures - or at least the versions of them we best remember - are relatively recent creations that are often less than two centuries old. The blog series, A History of Classic Monsters explores the origins and evolution of Halloween’s and Hollywood's best-loved ghouls and beasts. Dracula, as we know him today, is such a popular and established a character that most people do not realize that the popular characterization of him was only established in 1897 by Victorian-era author Bram Stoker. Dracula’s characterization as a sinister yet refined Continental aristocrat puts the book firmly into the late Victorian tradition of “invasion literature,” in which England is menaced by supernatural or technological forces; other works produced during this period included The War of the Worlds, by H.G. Wells, and The Great War in England in 1897, by William Le Queux. Although Stoker's book was well-reviewed and enjoyed by readers of the time as a horror/adventure story, it was not until the 20th-century film versions were produced that it became iconic. The first film adaptation of Dracula to become popular was the silent film Nosferatu, made in Germany and released in 1922. This film was very controversial because it was an unauthorized adaptation of Stoker's novel. In fact, the author's estate successfully sued the makers of the film for copyright infringement and ordered all copies destroyed, but the film had already been distributed across the world and destruction of all copies was impossible. Although much of the plot and most of the main characters are very similar to those of Dracula, Nosferatu differs greatly in one important aspect: the characterization of the vampire himself. Rather than creating other vampires, he spreads rats and plague. Instead of being aristocratic and charming, he is repellent and vile, and, most importantly, he can be utterly destroyed by sunlight. Vampires prior to Nosferatu’s Count Orlok could walk in the sunlight (true even in Stoker’s novel), but the climactic sequence of Orlok being destroyed by the rays of the morning sun became so iconic that the concept of the sun being destructive to all vampires was canonized in vampire literature and film. The early sound era saw Universal Studios begin a series of highly influential horror films, one of which was a 1931 adaptation of Stoker’s novel. Although Bela Lugosi is today considered by many the definitive actor to play Dracula, he was not the first choice for the role in this version. Character actors Lon Chaney, Paul Muni, Chester Morris, and John Wray were also considered for this production. Ultimately, Lugosi, who had played Dracula in the Broadway production, was chosen due to a drastic reduction in budget brought on by the Great Depression and his willingness to work for a smaller salary. 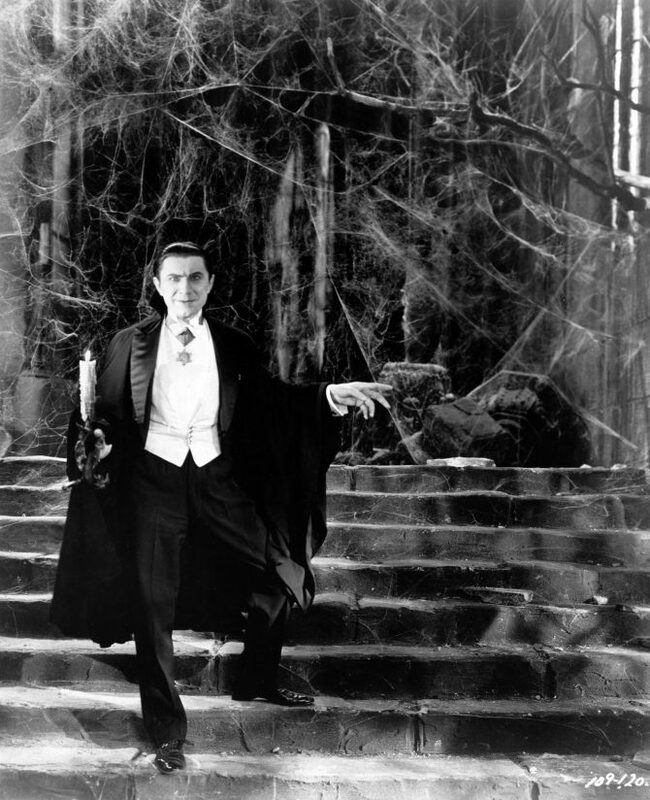 He went on to create a characterization of Dracula so iconic that it would influence every actor to take the role after him, and play a huge role in making horror films a viable genre in the U.S. market. In the 1950s, British film studio Hammer began making a series of edgy, violent adaptations of classic horror novels. In 1958, Hammer released Horror of Dracula, an adaptation of Bram Stoker’s novel that was extremely controversial at the time of its release due to its brutal violence. So violent was it that the British Board of Film Classification issued it an “X” rating. Despite or perhaps because of its much more graphic depiction of violence than prior versions of the novel, Horror of Dracula went on to become a great success worldwide and established Christopher Lee, who played Dracula, as one of the great actors in horror and science fiction films. Doctor Van Helsing was played by Peter Cushing, who would also play Sherlock Holmes, Victor Frankenstein, and Star Wars’ Grand Moff Tarkin. Hammer would become one of the most profitable film studios until the abolition of the Hays Code in the 1960s. Soon mainstream Hollywood studios began issuing products that were just as violent as Hammer’s horror films, if not more so. Dracula remains one of the most influential characters in literature. The romanticized portrayal of a vampire as a tragic lover became a major influence on more modern portrayals of vampires, including Frank Langella’s portrayal of Dracula in the 1979 film, Gary Oldman’s Dracula in the 1993 adaptation, and the romantic relationships portrayed in Stephanie Meyer’s Twilight series. Anne Rice's Gothic book series, The Vampire Chronicles, contains the most romanticized view of vampire culture. Beginning with Interview with the Vampire (1976), Rice writes of an ancient group of beautiful and mysterious creatures, who have lasted through the centuries, and survive many obstacles of both inner and outer threats. Two of her works from the Chronicles have been made into full-length feature films: Interview with the Vampire (1994), with Brad Pitt and Tom Cruise, and Queen of the Damned (2002), starring Stuart Townsend and music artist Aailyah. The brutish depictions of vampires such as Count Orlok in Nosferatu inspired characterizations such as the violent killers of the Blade films and 30 Days of Night. The FX Network now has a television show based off of Guillermo Del Toro's series of vampire novels called The Strain. Vampires have been popular since the dawn of the age of cinema and show no signs of losing their popularity. There will be cinematic portrayals of Dracula and his children for generations to come.